The concept of social murder has its roots in European workers’ movements of the 19th century. It refers to situations where those in power knowingly maintain conditions that inevitably lead to the early deaths of the poor.3 Here in Aotearoa New Zealand it might be tempting to comfort ourselves with the apparent absence of such appalling events. While it is true that there has not been such a dramatic loss of life by fire in recent history, another less obvious but equally noxious form of neglect is killing people in their homes. Housing in Aoteaora New Zealand is also a site of social murder. In Aotearoa New Zealand, a country that The Economist claims has the most unaffordable housing in the world, poverty, ill health, homelessness, and death, are produced as a matter of course by the normal functioning of capitalist housing markets.8 A lack of accessible alternatives – caused in part by an under resourced and misdirected public/state housing provider – enables monopoly prices to form in rental markets. The profit motive that drives market activity, including the leasing of housing to tenants, results in a significant amount of housing being poorly maintained. This causes negative health outcomes.9 The high cost of housing, along with often substandard quality, means that people living on low incomes suffer considerably as a direct result of their position in housing markets. At the same time, property investors secure rental returns and capture capital gains through owning land and housing. This article describes two political campaigns that have resisted social harm caused by market-driven housing developments. It seeks to expose the exploitative social relationships lurking beneath quantitative measures of economic growth and explains the high cost of housing in terms of the monopoly power of property owners to supply housing to those without access to capital. It is the ability of housing to function as capital, producing a profitable return on investment, that maintains the market price of housing. This analysis shows that market solutions actually reproduce the problem of unaffordable housing rather than solving it. Finally, two radical proposals for housing are put forward: a massive expansion and democratisation of public/state housing; and substantial increases in resource allocation for non-profit community housing projects. At the time of writing, there has been no sign that the New Zealand Government will act on the United Nations recommendations, and Fletcher Residential Ltd. intends to continue with the development. Fletcher’s project at Ihumātao not only seems to be in violation of Te Tiriti o Waitangi and the United Nations Declaration of the Rights of Indigenous People, it also threatens the existence of the longest occupied papakāinga in Aotearoa New Zealand that borders the site. Meanwhile, the SOUL campaign continues to receive broad media coverage, endorsements from a number of progressive politicians, and has widespread public support. The Tāmaki Housing Group and the SOUL campaign have centred the voices of Māori and Pasifika women, challenging not only dominant economic logics, but also settler colonialism, white supremacy, and patriarchy. It is no coincidence that both the Tāmaki Housing Group and the SOUL campaign are against market housing developments. Organisations following the logic of capitalist development in housing, as well as state institutions enabling these processes, fail to solve the housing crisis in Aotearoa New Zealand. 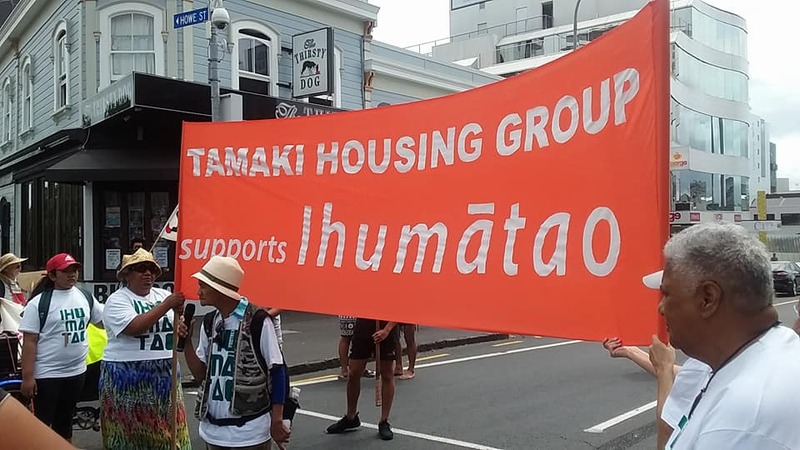 Market-led housing developments cause considerable social and environmental damage at the same time as producing a greater amount of unaffordable housing, the gentrification of neighbourhoods, and the violation of Māori land rights. In addition to maintaining lethally substandard housing, displacing existing public/state housing tenants, and building on stolen Māori land, housing markets also drive wealth inequality. Poverty, ill health, homelessness, and death are part of the same situation that sees landlords and property investors collecting rental income and making capital gains in housing.14 The inequalities caused by capitalist housing markets are not captured in measures of economic growth such as Gross Domestic Product (GDP). GDP is calculated in a way that includes residential building construction and leasing, as well as the business activities of associated industries.15 In other words, the construction and sale of expensive market housing, increases in rent prices, and the transactions of real estate agencies, all contribute to GDP growth. According to this metric, the rents tenants pay to landlords are counted as an economic good for the nation, even when these rents exceed what can be justified by the costs of construction and maintenance of buildings. GDP, as a measure of the economy, fails to account for the antagonistic interests of people occupying different positions in relation to privately owned property. Severe inequality in the housing sector highlights how a disproportionate focus on economic measures such as GDP gives an inadequate representation of society. It is the nature of economic relationships that are important, and not merely the growth of GDP. The reason housing in Aotearoa New Zealand is prohibitively expensive is due to the predominance of capitalist markets. Housing unaffordability continues to be a social issue because land and housing effectively function as capital. Housing deprivation – as well as the poverty, ill health, homelessness, and death sometimes associated with housing markets – is a direct outcome of a system in which it is legal to buy the right to exclude other people from living on a section of the earth, and to then charge monopoly rents to access shelter. There has been much debate on the issue of housing amongst economists, pundits, and parliamentary political parties. Where many seem to agree is on the idea that an increase in market housing will solve the crisis of affordability. This position overlooks the fact that it is the dynamics of the market itself – driven by the profit motive and underpinned by a system of private land rights – that has caused housing to become unaffordable in the first place. Markets do not provide for people’s needs if they are not in a position to pay market prices. Capitalist markets in Aotearoa New Zealand are producing housing for people with access to significant amounts of wealth, rather than people on low incomes. In practice, effective demand for housing comes from those with access to large sums of capital and, in the absence of viable alternatives, leaves everyone else in subordinate economic positions paying monopoly prices for rental housing. The solutions to the housing crisis for people living on low incomes lie outside of capitalist markets. Historically, quality housing has been provided for people on low incomes in Aotearoa New Zealand through mass builds of public/state housing.22 In recent times, however, the public/state housing option has been side-lined in favour of market solutions, to such an extent that the New Zealand Government is now pursuing a mass build of state funded market housing.23 The undermining of pubic/state housing systems through turning public resources over to the market is known as the ‘privatisation trap’.24 This trend shows that ‘when social/public rental housing is built, sooner or later there is a demand for its privatization, or it is transformed into de facto homeownership support’.25 The process is self-defeating, reproducing the same situation that had required public/state intervention to begin with. While increasing the market supply of housing can have some short-term effects on dampening house price speculation, it fails to solve the housing crisis for people on low incomes. Once housing enters the private market it is subjected to the same profit motives, monopoly rents, and speculative pricing mechanisms that cause housing crises in the first instance. Failing to expand and democratise non-market housing solutions means homeowners are still able to appropriate unearned wealth from the economy, while those most in need are left to grapple with monopoly prices for substandard housing. Parliamentary political parties campaigned to solve the housing crisis in the run up to the New Zealand General Election on 23 September 2017. The housing policies being developed fail to properly address the underlying causes of the human suffering produced by our contemporary situation. Specifically, public/state housing, and other non-market community housing options such as papakāinga, remain marginal rather than prioritised as the primary solutions to the inequality produced by capitalist markets. The argument that needs to gain traction in the public sphere is that capitalist markets are structurally unable to provide universal access to healthy, secure, and affordable housing. There is a need for collectively planned and democratic alternatives. Radical reforms get to the root of a problem, oppose vested interests, and call the logic of the market system into question.26 The root of the housing crisis is a process of capital accumulation in land. The solution to this problem is straightforward: the market price of land needs to be eliminated from the housing equation. This can be achieved through transferring private land into public ownership through the state, and/or facilitating common ownership of land using various legal structures. In other words, we need to reconfigure our relations to the Earth and to each other, in both a legal and cultural sense, so as to recognise use rights to land as collective, inalienable, and unable to be traded in a market for profit. Once the market price of land no longer influences the price of housing, only construction and maintenance costs remain. Non-market collective land rights open up exciting prospects for housing development. Commercial banks are wary of lending for papakāinga housing construction because of the barriers commonly-owned land presents for capital accumulation. Specifically, it is ‘virtually impossible to place a capital value’ on papakāinga housing because it ‘effectively cannot be sold on the open market’.31 This means ‘banks are wary of their lack of security if owners default on mortgage payments’ because title to the house does not include the underlying land.32 A crucial difference between market housing and papakāinga housing is that the latter depreciates as buildings age and the former accumulates value as ground-rent increases. As the name suggests, ground-rent accrues to land rather than buildings. Therefore, holding land in common provides a certain amount of protection from capitalist speculation. In other words, papakāinga housing tends to not function as capital. Local and central government could help facilitate more community driven housing developments using papakāinga models. This could be achieved through prioritising collective use rights to land that recognise He Whakaputanga, Te Tiriti o Waitangi, and the principle of tino rangatiratanga as foundational to all land rights in Aotearoa New Zealand. Additionally, government could make significantly more resources available to non-profit community housing projects by taxing accumulated wealth, while also maintaining a functional system of universally accessible quality public/state housing with maintenance rents. An easily accessible public/state housing system is an effective means of deflating the price of land and housing as long as it significantly undercuts monopoly prices in markets. This would make papakāinga projects more affordable for any groups needing to purchase land in a market. As has already been argued, it would be preferable to do away with capitalist markets in private land titles completely, as trading legal rights to private land not only allows surplus value to accumulate in the soil, but also goes against the tikanga principles that underpin the whole papakāinga development model. Centring papakāinga models in urban and rural planning could additionally serve to remind people living in Aotearoa New Zealand that the whole country was once Māori land, and in many ways still is. The processes through which settlers attempted to deny Māori traditional land rights and the ability to practice kaitiakitanga are part of a history of injustice. Radical political movements concerned with housing provide welcome opportunities to support Māori land claims. For the obvious reason that housing is built on the land, but also because drawing on traditional Māori practices of holding land in common under local authority can be a central part of the solution to our contemporary housing crisis. We are in a unique political, economic, historical, and cultural situation here in Aotearoa New Zealand. At the same time, nearly every major city in the world is currently experiencing some form of crisis in residential housing.33 Housing struggles connect the local with the global, exposing common tendencies in capitalist economies. Paying close attention to the contemporary housing situation in Aotearoa New Zealand reveals that society is comprised of groups with antagonistic economic interests. Capitalist markets in land and housing drive social inequality, leading to impoverishment, poor health, homelessness, and sometimes death for people living on low incomes. While investors are able to make windfall profits, actors in these markets routinely contravene the public interest, as they are primarily driven by the profit motive. From the perspective of capitalist corporations such as Fletcher Residential Ltd. and Tāmaki Regeneration Co., indigenous land rights and public/state housing tenants refusing eviction are merely problems to be overcome or circumvented. Housing in Aotearoa New Zealand demonstrates a general truth about the economy: capitalist markets are functionally incapable of providing everyone with the basic necessities of life. The profits flowing out of the housing market are not only a testament to the sustained neglect of the most vulnerable members of society, but rely on the ongoing history of colonisation. Against these trends, quality public/state housing with maintenance rents and non-profit community housing models – both of which have the capacity to eliminate the price of land from housing costs – offer viable alternatives to perpetuating a market-driven crisis in housing. In our contemporary historical moment, housing issues demand the attention of any social movements aiming to connect local issues with visions for a better world. Not as a strategic choice, but as a political necessity. 3 Friedrich Engels. The Condition of the Working Class in England. Middlesex, England: Penguin, 1987, p. 127. 4 Jane Oliver, Tim Foster, Amanda Kvalsvig, Deborah A Williamson, Michael G Baker and Nevil Pierse. ‘Risk of Hospitalisation and Death for Vulnerable New Zealand Children’. Archives of Disease in Childhood (2017), p. 4. 6 Philippa Anderson, Elizabeth Craig, Gary Jackson and Catherine Jackson. ‘Developing a Tool to Monitor Potentially Avoidable and Ambulatory Care Sensitive Hospitalisations in New Zealand Children’. New Zealand Medical Journal, vol. 125, no. 1366 (2012), p. 27. 8 The Economist. ‘Global House Prices’, The Economist, 9 March 2017. Last accessed 18 December 2017. https://www.economist.com/blogs/graphicdetail/2017/03/daily-chart-6?fsrc=scn/tw/te/bl/ed/; Shane Malva, ‘The Imminent Ruin of the Auckland Housing Crisis: Social Resistance Against the Financialisation of Housing’. New Zealand Sociology, vol. 31, no. 6 (2016): 10-33. 9 Neil Smith. The New Urban Frontier: Gentrification and the Revanchist City. London: Routledge, 1996: 64-65. 10 Vanessa Cole. WE SHALL NOT BE MOVED: Community Displacement and Dissensus in the Gentrification of Glen Innes, Tāmaki Makaurau. Masters Thesis, University of Auckland, 2015, p. 79. 12 United Nations Committee on the Elimination of Racial Discrimination, Concluding observations on the combined twenty-first and twenty-second periodic reports of New Zealand, 25 August 2017, p. 5. 14 Philippa Howden-Chapman. Home Truths: Confronting New Zealand’s Housing Crisis. Wellington: Bridget Williams Books, 2015. 17 Karl Marx. Capital: Volume Three. London: Penguin, 1981. 18 Shamubeel Eaqub and Selena Eaqub. Generation Rent: Rethinking New Zealand’s Priorities. Wellington: Bridget Williams Books, 2015. 19 Karl Marx, Capital: Volume One. London: Penguin, 1981. 20 International Monetary Fund. ‘New Zealand: Selected issues. [IMF Country Report No. 16/40]’. International Monetary Fund. February 2016. Last accessed 7 December 2017. 22 Ben Schrader. We Call it Home: A History of State Housing in New Zealand. Auckland: Reed, 2005. 24 Martin Lux and Petr Sunega. ‘Public Housing in the Post-Socialist States of Central and Eastern Europe: Decline and an Open Future’. Housing Studies vol. 29, no. 4 (2014): 501-519. 26 André Gorz. A Strategy for Labor: A Radical Proposal. Boston: Beacon Press, 1964. 27 Lara Burkhardt, Nick Swallow and Holland Beckett. ‘Papakāinga Development – Turning Aspiration into Reality’. Resource Management Journal, (2014): 11. 33 David Madden and Peter Marcuse. In Defense of Housing. London: Verso, 2016. Shane Malva is a member of ESRA’s Housing Inquiry Group, coordinator of Organise Aotearoa’s Housing Working Group, and an activist researcher with SOUL.